In celebration of my new book GetTheGuy, and my new show on NBC ‘Ready For Love’, I’m going to 10 major USA cities to help women across America find love. This video was taken from a question and answer session at my Los Angeles event (the first stop on the tour). I still have 9 more stops to go, and there is still time to get tickets. Simple but powerful attraction methods that will have men falling over themselves to meet you – I’m even going to show you how you can transform your physical attractiveness to a man using just the way you move. The simplest ways to meet quality guys and the best places – Your weekends will be full of exciting meet-ups with new guys that you WANT to spend time with. The psychology of men – delving inside the male mind to figure out the answers to questions like, “Why didn’t he call back?” and, “Why is he blowing hot and cold?”. Why men don’t commit and how to get him to commit – You will see a DRAMATIC change in him almost instantly. What keeps men interested – NEVER AGAIN will you wonder why he won’t call you back, or contact you when you’ve had such a great time together. And all you have to do to get your ticket is order a copy of the GetTheGuy book. All events will run from 1–5pm with the exception of New York which will run from 2–6pm. All venues will be confirmed on sending in your receipt. 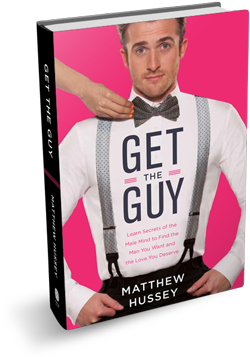 Once you have pre-ordered your book and have your receipt, forward it onto the team at TODAY@gettheguybook.com with your name, contact number, and chosen date/location. We’ll then put you on the guest list, confirm your place by email, and let you know the venue. That’s it, no extra ticket fee.